Mending Gold: Leh Palace, Leh, Ladakh, India | Site specific before mending the worn landscape below Leh Palace | Gold yarn | The architecture that has preserved so much of the culture has become threatened due to climate change over the past fifty years. The desert region once preserved and sheltered from the monsoon by the high altitude of the Himalaya Mountains has become threatened by the increase of rainfall. The traditional construction of buildings with stone and mortar cannot withstand the changing climate conditions and risks from deterioration. Working with a group of American, Canadian and French architects they researched and documented details and parts of the architecture to try and find solutions to protect the buildings as I thought of mending as metaphor. Inspired by the landscape, textiles, and community, I began to think about what it would mean to mend one of the thousands of walls that are in need of repair. Situated just below the nine-story Leh Palace, I mended a portion of a stonewall, Mending Gold: Leh Palace, Leh Ladakh, India, 2016. Following the crumbling lines of mortar between stones I intuitively stitched with gold thread admiring the drastic contrasts within the landscape. 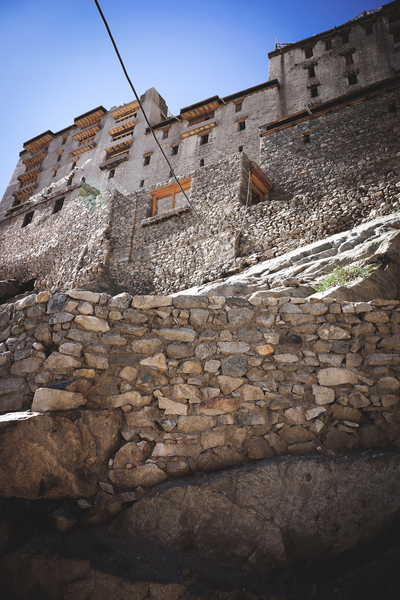 Just as the architects seek to find a solution to preserve the distinct architectural style of Ladakh, I too seek to mend and help preserve a culture at risk from outside forces.